I woke up at 4am to get ready to crazy brick. I saw some lightening and heard some waves of rain pass over us, but still couldn't tell how the weather would be for the day. I knew I wasn't going to head to G'ston to brick with the rest of MC's athletes, but I also didn't want the workout hanging over my head all weekend. I originally wanted to start at 5:50 am to get it done and over with as early as possible, but that wasn't happening with the supposed "threat" of Don. Once the sun came up, it was clear out, so I hit the road around 7am. Overall the brick challenge was okay. I had a really great first :30 run in that my pace was sub 13 AND I ran the whole thing without intervals. However, I didn't pay attention to the fact it was supposed to be a slower "IM effort" run. My IM effort heart rate is pretty much speed walking, since my running pace is slower. We were supposed to target IM effort to simulate the energy expenditure for the swim. Oh well. Now, the second run? Holy crap... head index was 103 by the time went out and I have no idea what I was thinking when I left for my :45 minute run with a 10oz. palm bottle. It was just terrible. I went out fine to start, but at 25 minutes in I just tanked; I had to start doing intervals. As bad as the second run felt, I really attribute it to the heat and not bringing enough hydration with me. I really feel like my nutrition is making a difference in my overall performance, and am glad that alternating Perpeteum and Nuun seems to be working for me. My stomach felt fine for the 2nd run yesterday, so that's a good sign. Clear Lake International will be the real test, in a race setting. I just really pray this whacky heat cools off, just a little bit, soon! I hate that feeling of cooking from the inside out. 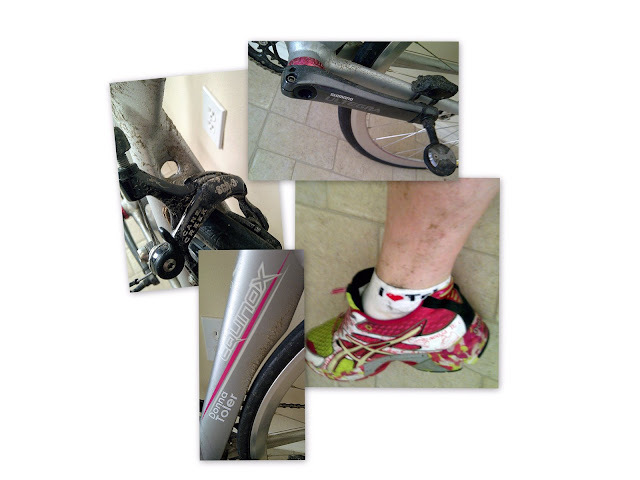 By the time I got home yesterday I couldn't tell if I had been triathlon training or had done a Muddy Buddy race. My bike... and my body, were covered in dirt. 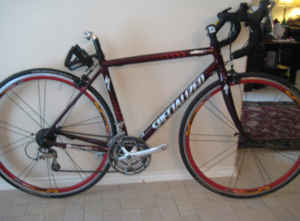 My bike needs some love today, for sure. Muddy Buddy or Triathlon Training?